Michael Bennett is set to join the New England Patriots this week and said Monday he told the team he will not stand on the sidelines for the national anthem next season. Bennett, who will reportedly be traded from the Philadelphia Eagles when the league year opens on Wednesday, said he told the Patriots he will remain in the locker room for the pregame ceremony. "I explained to them that my integrity means everything," Bennett said while speaking at Princeton University, per ESPN. "I think they respect that about me, they respect who I am as an individual." "The Patriots have been trying to trade for me for two years," he added. "Last year they tried to get me, the year before they tried to get me." Patriots head coach Bill Belichick and quarterback Tom Brady are open supporters of president Donald Trump, who has called on NFL owners to fire players who protest during the anthem. Bennett said he was looking forward to speaking with both Belichick and Brady on their political views. "I think it's important not to run away from those conversations, or not hear their ideas about why they think the way they do," the 33-year-old said. "I think it's an opportunity for growth to have those conversations," he added. "If we don't allow ourselves to have those conversations, we're stunting our growth." The league introduced a new rule last May requiring any player on the sidelines for the anthem to stand, while giving players the option to remain in the dressing room if they prefer. 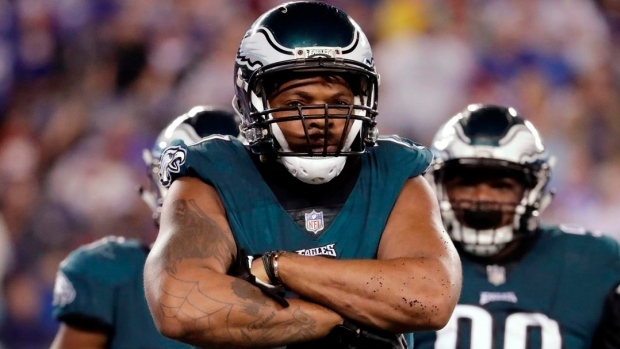 Bennett elected to stay in the locker room during the anthem last season with the Eagles.